Porch of the Czaple Wielkie mansion. 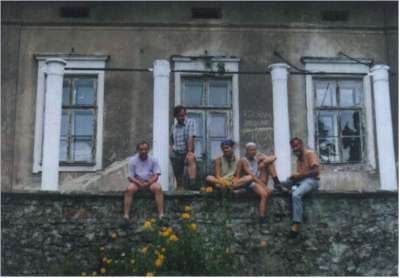 On the porch from left: Marek and Jan Szpor, sons of Augustyn Szpor i Anna Popiel, Basia Szpor, Jan's daughter, Agnieszka Szpor, Eustachy's daughter (Marek's and Jan's brother) - the first on right. Mr. Eustachy Popiel (not shown on photo), with other legal heirs of Czaple Wielkie is trying to repossess the estate. Photo received from Mr. Bartlomiej Szpor, grandson of Anna Popiel of Czaple Wielkie.